Brian Selznick’s books are, to me, what a graphic novel should be. A wonderful story punctuated by amazing drawings. I was a fan of The Invention of Hugo Cabret and, now, I’m a fan of Wonderstruck, as well. This story is about a boy in northern Minnesota named Ben. Ben’s living with his aunt, uncle, and cousins after losing his mom in a car accident. 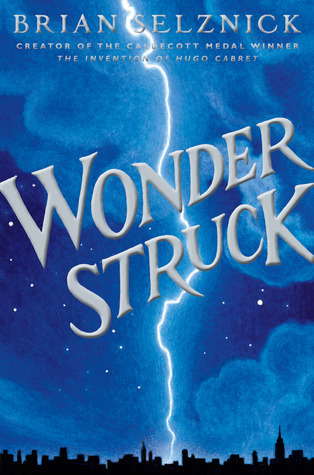 One night he finds the courage to go back to the house he once shared with his mom and he finds a book, Wonderstruck, that captures his interest. Even more so when a bookmark falls out that might include a clue to who Ben’s father is. But a lightening strike puts Ben in the hospital and derails his plans of finding the man who may be his father. It is also the story of Rose, a girl in the 1920’s who lives in Hoboken, NJ and dreams of New York City. Her mother is famous, but Rose barely sees her. Instead, she lives with her father, a doctor, and builds paper models of New York in her bedroom. One day, Rose gets the courage to sneak away to New York, but her mother isn’t at all pleased to see her. She runs, instead, to the museum and her brother, Walter, finds her there and takes her home. There are common threads in both Ben and Anna’s stories, but the most obvious one is that both children are deaf. Both children are also fascinated with the museum and collecting – and that is a fascination which connects them in profound and unbreakable ways. The story is wonderful and the illustrations are captivating. Five stars!